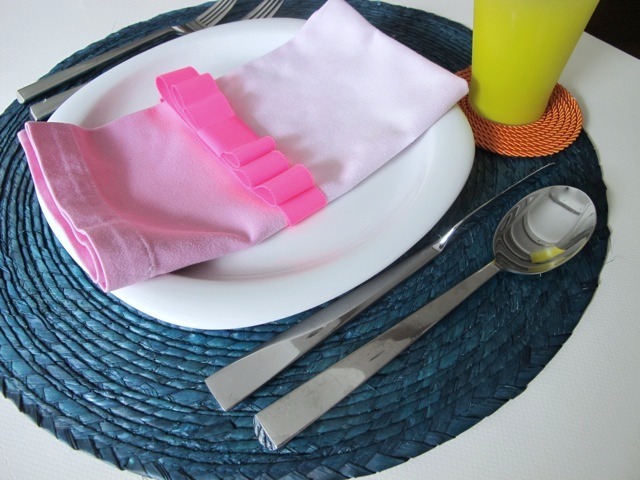 Thank you Nicole from Sketch42 for sending in this perfect Shavuot table napkin do-it-yourself craft! All of the items here can be purchased at M and J Trimmings in Manhattan so head on over there for some great Shavuot table inspiration! They have tons of ribbon, trim, feathers, flowers and more. The creative possibilities are endless! 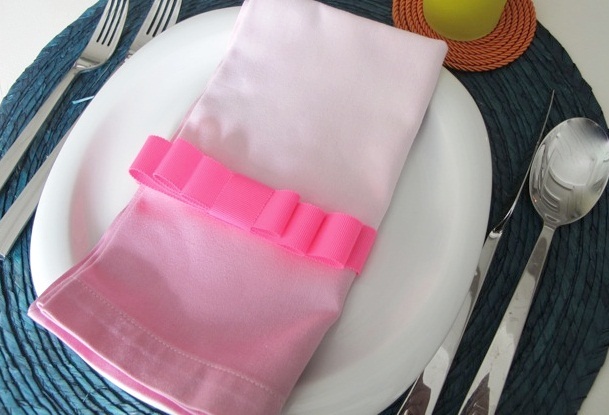 Its time to spruce up your Shavuot table!! This spring I am SO inspired by neons and color, andI have been dying to do some dip-dying ever since I made some tie-dye napkins this summer. Dip Dying seems just a tad more sophisticated and is a much simpler affair. So for my first project, I made a place setting that I would use for a spring lunch or brunch. 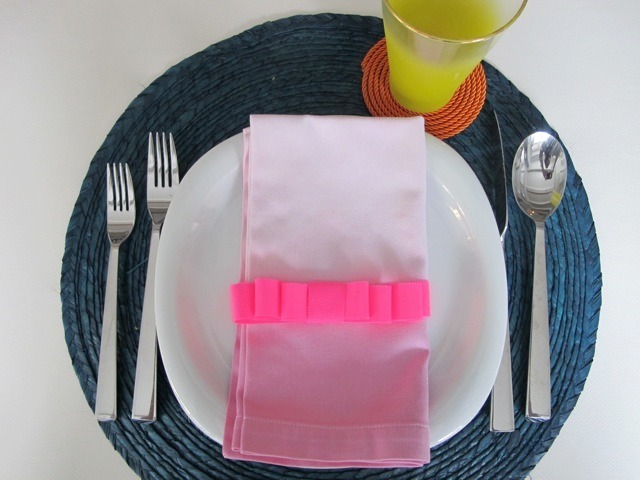 The great thing about this project is that even just by using the neon grosgrain bow as a napkin ring, you can set a totally current and chic table with very little permanence or cost. Follow the instructions on the Rit Dye Box. I chose to do mine on the stove. Mix dye with hot water, salt and a small amount of detergent. Stir and wait until desired color is achieved. Take clean, washed napkins and dip into the dye bath. I dipped the edges of one napkin, the side of another and the bottom of another. Ultimately, the napkin with the dyed bottom was the most successful. Immediately rinse with warm water, then cold until the water runs clear. Project 2 Instructions: Neon Grosgrain Bow. Begin the bow by winding the ribbon back and forth to form three loops. To do this, first form one loop. Holding the loop at its midpoint, wind the ribbon underneath to form another loop that is slightly larger than the first. Now hold both of the loops together at their midpoints and wind the ribbon underneath in the opposite direction to form a final loop, again slightly larger than the previous. Staple them together at the midpoint. Wrap a small piece of ribbon over the staple and secure in the back with a glue gun. 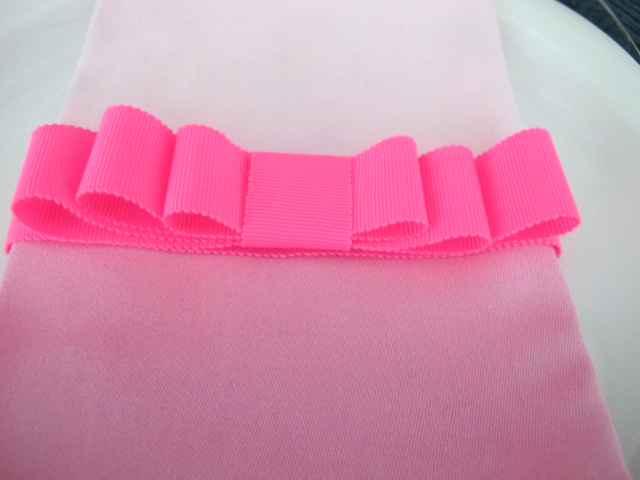 Attach to the center of the extra ribbon , and using the glue gun secure the ends of the ribbon to each other. Remove the tape from the edge of your cord. Using a glue gun, apply a little bit of glue to the edge of your cord to stop fraying . 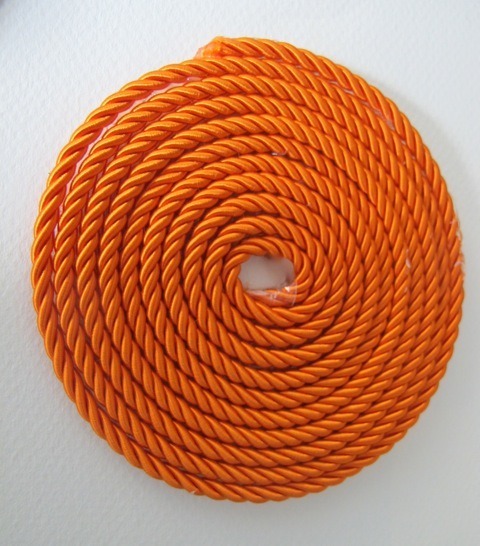 Place the cord flat on a table and wrap the cord into a spiral, using one hand to keep it flat and the other to twist. Take your glue gun and cover the entire cord with glue. Make sure that the glue gets in between the cord. Finish the edge of the cord with a little more glue and tuck it into the side of the coaster. After the glue dries, turn it over and voila! Thank you cousin Robin Antar for sending in Aunt Linda’s traditional Shavuot table. Aunt Linda and Uncle Leon are known for their warmth, grace and great style. Their Shavuot table is a perfect reflection of their wonderful hobby of collecting unique and beautiful dishes and glassware, so that they can continually gather their family around their inviting table. This Shavuot table gave me a great excuse to call Aunt Linda. Always happy to answer my questions, whether it be about her parent’s history coming from Syria, or to tell me about her elegant Shavuot table, its always fun, and a pleasure to speak to her. The crystal goblets are from aunt Linda’s antique collection of Heisey crystal, the lace tablecloth is a purchase from a vacation to St. Thomas, the silver flatware is Christofle, and her dishes were a post wedding purchase from an English china company. On the menu was, Koosa B’jiben (squash quiche mixed with cheese and eggs), an assorted cheese platter arranged by her grandaughter Marjorie, avocado salad with lemon and cumin, sliced tomato, basil and cheese platter, and much, much more! By the way, Aunt Linda and Uncle Leon are very proud of their daughter Robin Antar, who is a famous sculptor, and who has a 6,000 pound sculpture of a bag of potato chips that is sitting in her garage at the time of this posting… Robin’ pieces are in some of the most prestigious corporate headquarters in the world. Doc Martin’s, Chateau Haut Brion Wines, Sketcher’s Boots and more. Check out Robin’s video HERE. Robin’s work is also includes a beautiful collection of Torah cases and Judaica that are featured in OUR ART, a 400 page coffee table book collection of 300 artists of the Sephardic Community. I also want to say that I really admire Aunt Linda and Uncle Leon for supporting their daughter’s artistic passion!!! Several years ago I viewed a documentary entitled “Hiding and Seeking: Faith and Tolerance After the Holocaust“ that sounds so similar to her story, I hope you don’t mind that I linked to a clip of it above. Its about a man who took his children to Poland to thank the non-Jews that hid their grandfather during the holocaust. I highly recommend everyone buy a copy of the film from Amazon and show it to their kids and grandkids! For all of you that may not know Linda, she is the ultimate Jewish Hostess entrepreneur who started her business career in the 80’s designing and selling gorgeous stone encrusted angora sweaters to major department stores all over the country. Of course since we were getting wholesale prices, I do believe that my mother was Linda’s best customer at the time, shlepping us girls into Linda’s basement to try on the stunning line of knits. Linda advised my mom to preserve the fuzzy angoras in a cold area. I think that dozens of Linda’s sweaters must still be frozen solid in the deep freezer that is in our old house on the corner of Bedford and J….. Thank you Linda for sharing your gorgeous New Jersey ocean view and Shavuot table with all of us that are still sweating in good old Brooklyn, N.Y.! I’m waiting for more Shavuot Table pics from all of my Jewish Hostesses!!!! Lalique stemware and glasses from France,bought in 1977 !!! St. Martin dishes Mikasa, 2005. Napkin rings are bangles from the accessory district. WIN A BRAND NEW VIKING MIXER!!! JUST CLICK HERE TO ENTER!!! In the summer of 2011, the Table Set GO event in Deal, New Jersey (sponsored by the Morris I. Franco Community Cancer Center) showcased the communities’ women’s striking table decor talents. Each table represented a unique Jewish holiday ‘s theme. The botanical holiday of Shavuot was displayed by Barbara Chehebar, Ruthie Bibi, and Adele Pardo. This table decor’s shades of blues and purples heralded the arrival of Shavuot’s custom of decorating one’s home, the synagogue and even the Torah scroll itself with greens and flowers in honor of the holiday. This custom of flowers and greens was based upon a statement in Midrash that the foot of Mount Sinai (where the Jews stood in awe, awaiting the granting of the Torah) was carpeted with greens and sweet smelling flowers. To accent the Shavuot table’s floral decor and centerpiece, the girls used Kim Seybert napkin rings, geometric Pucci scarves, sky blue bordered china dinnerware, and sparkling crystal stemware. Delicate blue dotted quilted linens were the backdrop to this elaborate variety of sweet smelling Shavuot florals. Mini Torahs and two mountains of roses, represented the giving of the Torah at Mount Sinaii. Thank you ladies for all of your hard work, table setting ideas inspiration! I’m so glad that we have the photos to remember this stunning event! Fantastic Fuchsias for Your Shavuot Table! Enjoy this Fantastic Fuchsia Table on Shavuot !!! For al of you design junkies, the Kips Bay Deorators Showhouse in New York is a must see. This years spectacular show has a fabulous room decorated by Amanda Nisbet. Nisbet is a successful interior designer who has created a name for herself with her glamorous yet comfortable style.”I pride myself on never doing the same thing twice.” Her love for hot pink and has inspired me to put together this fantastic fuchsia table for Shavuot. Happy Holiday! Flatware $105 available at Addy and Co.
Shop HERE for holiday gifts and tableware at Addy’s. Click HERE for gorgeous lingerie gifts and shopping. Enjoy the Amanda Nesbit design inspirations below! Veggie Egg White Pizza Omelet by Grace G.
From the day before you can saute onions, mushrooms and peppers until soft and refrigerate. Next day heat frying pan with Pam,beat egg whites and pour into pan. 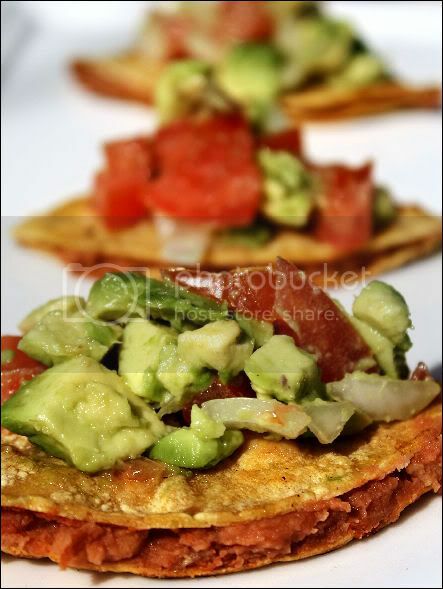 Add sauteed veggies into omelete along with diced raw tomatoes…let cook. Flip over once add salt and pepper. When the egg omelete is done place onto a plate…to make it fun cut like a pizza!! If desired you can sprinkle with chopped parsley. Mother’s Day and Shavuot would not be the same in a Sephardic Jewish household if we did not serve samboosak as a side dish on the table. Many people even serve it with the dessert and coffee or tea at the end of the dairy meal. A bag of frozen unbaked sambousak is considered like “gold” because of the loving handmade touch of each delectable crimped half moon pastry. Remember to always keep a bag of frozen samboosak in the freezer for an unexpected guest! 1/2 tsp aluminum-free baking powder. one beaten egg in a small bowl for dipping sambousak. 3/4 cup sesame seeds mixes with 1/2 tsp of kosher salt. Mix flour, semolina and salt. Add butter , add water and oil slowly. In a glass bowl, mix grated cheese with aluminum-free baking powder and eggs . roll the dough into walnut size balls. fold over and crimp, starting at one end, rolling the dough between your thumb and forefinger and pinching as you turn the half moon. It takes practice! dip half moon into beaten egg, and then into sesame seed mixture. place on sprayed parchment on a cookie pan. bake at 350 degees for approximately 20 minutes. Done when bottom of each sambousak is a light brown and top is perfectly baked. “Hi! Its Shirley from HomeBaked.com , counting down the days till Shavuot . This holiday is definitely one of my personal favorites – so rich in tradition, spirituality, introspection, and of course, outstanding desserts. These adorable little treats are pretty simple to make (in fact, I bet kids would have a blast dipping them in the melted chocolate and sprinkles), can be eaten with minimal guilt (considering you can stop at just one), and will certainly still pay a respectful homage to the traditional cheesecake that I am sure we would all like to let go of for a while. While there are a bunch of steps involved in this recipe, do not get overwhelmed – each can be done in stages, and can be spread out across several days. Position oven rack in the middle of the oven and preheat to 325 degrees F. Set some water to boil. In a large bowl, beat together the cream cheese, sugar, flour, and salt until smooth. If using a mixer, mix on low speed. Add the whole eggs and the egg yolks, one at a time, beating well (but still at low speed) after each addition. Beat in the vanilla and cream. Grease a 10-inch cake pan (not a springform pan), and pour the batter into the cake pan. Place the pan in a larger roasting pan. Fill the roasting pan with the boiling water until it reaches halfway up the sides of the cake pan. Bake until the cheesecake is firm and slightly golden on top, 35 to 45 minutes. Remove the cheesecake from the water bath and cool to room temperature. Cover the cheesecake with plastic wrap and refrigerate until very cold, at least 3 hours or up to overnight. When the cheesecake is cold and very firm, scoop the cheesecake into 2-ounce balls and place on a parchment paper-lined baking sheet. Carefully insert a lollipop stick into each cheesecake ball. Freeze the cheesecake pops, uncovered, until very hard, at least 1 – 2 hours. You can also chop up Heath Bars as a delectable topping. So, enjoy your Shavuot, enjoy your cheesecake, be sure to post any questions or comments and I’ll be happy to answer. P.S. Don’t forget to check out HomeBaked.com for any dessert needs! What an easy and gorgeous trifle for your Mother’s Day, Shavuot or summer brunch! (You can even whip up a pareve version for Shabbat dessert). Just cube assorted colorful fruit and layer into a trifle bowl or a huge florist cube or cylinder. Make sure all of the fruit is cubed perfectly and all are similar size for a prettier dessert display! Instant espresso, powdered cocoa or orange or lime zest. Leave the metal Kitchen Aid bowl and the metal whisk in freezer overnight. Beat until the cream holds it's shape when you lift the whisk attachment. Layer and serve immediately with fruit. You can add instant espresso, powdered cocoa or orange or lime zest to the cream as you are whipping it. Karen Tawil is one of the most creative and talented people I know. Years ago, Karen volunteered for a Sephardic Bikur Holim bake sale that we were working on. In one day, she ran down to the flower district and bought tons of bonsai plants, flowers, and all sorts of containers and ribbon, and created about 50 of the coolest Shabbat arrangements for sale. Needless to say, we were all sold out within hours, and it greatly helped us add to the profits and enjoyment of the day! Thanks for sharing your breathtaking holiday table settings with us, Karen! You make it look so easy!!! p.s. To all of my Jewish Hostesses! keep sending in your holiday photos to marlene(AT)thejewishhostess.com! use the @!! I love the reaction of my guests when they come into our home and they get excited with all they see. I feel like the table setting makes the meal memorable even if its a meal as simple as bbq. For shavuot lunch it was just the four of us. I used a woven leather placemat from Pottery Barn with a silver charger ,the dishes are limoge and the flatware is lucite. I used stargazer and blue hydrangeas……. On Tuesday July 11, the fabulously talented women of the Sephardic community in Deal, New Jersey unleashed their creative table setting talents to amaze hundreds of Jewish women who arrived to support the Morris I. Franco Community Cancer Center. This event, staged on the spacious summer porch of the home of our gracious hosts,Charles and Ariella Ben Dayan, was a competition that consisted of eight teams of 1-5 women per team. Each team was given a random holiday theme, in which they created a unique table setting. The basic rule was that they must use a 48 inch round table that was supplied to them, and from there on in, the sky was the limit. An impressive lunch, chinese auction gifts, and demonstrations were also featured during the day. Pictures are worth a thousand words, so go on and feast your eyes!!!! This Rosh Hashanah table is truly a work of art and imagination. The table was lined with a vintage table cloth. Next, the girls layered the table with bamboo place mats, a gold woven place mat, green glass charger, gold dish, a hand painted gold leaf salad plate, embroidered leaves napkin and gold flatware. Note the symbolic silver apple that tops off the whole place setting. Of course we “dip the apple in the honey” to symbolize the hopefully sweet upcoming New Year. Are you starting to get a little anxious about when is Rosh Hashanah this year of 2011? Well, mark your calendars and get back on the beach! You’ve got till Sept 28 at sundown to start dipping those apples….. Above: Note the LIVE FISH swimming in the elongated green vases. A genius idea!!! Of course the fish are a perfect symbol of The Jewish New Year, as many people serve the head of the fish on the Rosh Hashanah table to symbolize the fact that we should be the “Rosh” (the head)and not the ” Zanav”(the tail). The fish also symbolize our custom of “Tashlich” in which we throw our sins into a live body of water that contains fish. The photo above was taken by Norma Cohen just seconds before an ocean breeze sent one of the vases toppling over. Thankfully Grace Chehebar saved the day and scooped all of the flopping fish off of the porch and flung them into the second vase. Note the Shofar candlesticks above!!! Above :I LOVE the silver apple casually placed in to the bowl of green apples!!! Swish some lemon juice around the apple sides and top (this may be done the night before the holiday). If you’re in need of new dinner menu idea, look no further than a classic quesadilla! Perfect for entertaining or a weeknight kid- friendly dinnner! I used corn tortillas, replaced the typical ground beef with fat free refried beans, and featured creamy avocados instead of cheese and sour cream, so this party pleaser is healthy, light (less than 80 calories per quarter! ), kosher parve, vegan, and gluten free. Not to mention, the triangle shape makes for easy snacking, as well as a festive touch for any get together. 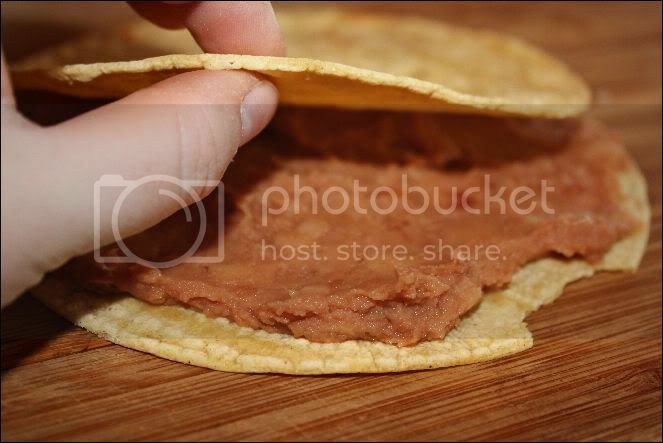 * If you’re vegan, be sure to check your refried beans. Some have added sugar. In a small bowl, combine beans and hot sauce or chiles. On half the corn tortillas, spread 1/4 cup refried beans on each. Place a second tortilla on top of each and press down slightly. You can always use more if 1/4 cup is too scant for your taste. There’s no such thing as too much deliciousness. You’ll have three whole quesadillas now. In a large skillet, panfry each quesadilla over medium-high heat. You don’t need to use oil, but a bit of nonstick spray will help to make the edges nice and crisp. When the quesadillas are golden and crispy, cut each into quarters and set aside. You’ll have 12 wedges. In a medium bowl, toss together your tomato, avocado, onion, and lime juice. Spoon over the top of your warm quesadilla wedges and serve immediately! You can always add shredded purple cabbage for more color, or a bit of greek yogurt if you don’t mind dairy, or plain soy yogurt to keep them parve.